Diaz hopes mechanical consistency and improved outings at home will help be "one of the best relievers in baseball." PEORIA, Ariz. — It occurred about 12 pitches into his first official bullpen of spring training. It probably wasn’t noticeable to the handful of fans watching at the Mariners complex. But for closer Edwin Diaz, it was a reminder of what knocked him out of the closing role for a 10-day period in May, what helped him to regain the job for the remainder of the season and what will be key for the improvements that he wants in 2018. Having already thrown seven bullpen sessions and a live batting-practice session before even arriving in Peoria, Diaz looked smooth in zipping fastballs to catcher Mike Zunino. The familiar pop of the ball snapping into Zunino’s glove gave an indication of the surprising early velocity from Diaz in the controlled environment. But then a fastball came out of his hand, riding up and in to the imaginary right-handed batter in the box, nowhere near the strike zone. Diaz followed that wayward fastball with another in almost the exact spot. Mariners fan remember those off-target pitches from when Diaz struggled, a result of mechanical breakdowns. But without the prompting of Zunino or pitching coach Mel Stottlemyre, who was standing nearby, Diaz took a moment after getting the ball back from Zunino. He stared at it in his hand, said a few words to himself and stepped back on the rubber. His next fastball hissed with intensity and was a perfect strike on the inside corner. It was followed by another and another and another. “You saw today when I missed a couple pitches, I refocused my mind and made the adjustment,” he said. Few pitchers‘ first full season in the big leagues come in the high-pressure role of closing. But Diaz’s brilliance after being called up mid-2016 pushed him into a situation that the Mariners believed he was ready to flourish in at age 22. The early struggles and the demotion in late May certainly tested that faith. But he rebounded to finish the season with 34 saves and a 3.27 ERA in 66 appearances, including 89 strikeouts in 66 innings. The brief demotion to a set-up role forced him to adjust his preparation techniques and focus on his mechanics. The goal was to find consistency and the ability to self-correct during the game. When everything started to fall apart, he had to be able to pull it back together immediately. As a closer, it’s either: adjust or fail and lose. Part of the process of thinking like an old guy on the mound is understanding the details of your delivery and knowing what makes it work. Diaz does that through daily drills and repetition before throwing a baseball. Diaz will repeat his delivery over and over with a towel in his hand, watching, studying in the mirror while building muscle memory. On days he doesn’t throw bullpens, he still steps on a mound with the towel to practice his delivery. Indeed, if not for a nasty bout with a flu bug that has been problem in Puerto Rico, Diaz would have come to camp at 195 pounds. But he dropped seven pounds from the illness two weeks ago. He plans to gain those lost pounds back. Well, at least he didn’t say he was old with his 24th birthday looming on March 22. Beyond the early mechanical inconsistencies of 2017, Diaz’s other goal is to address his struggles at home. He was dominant away from Safeco Field, going 25 for 27 in save opportunities with a 1.24 ERA with 54 strikeouts in 35 appearances. While he converted nine of 12 saves at home, he was charged with four losses and posted a 5.76 ERA in 31 appearances. Opposing hitters posted a .371 on-base percentage and .504 slugging percentage against Diaz in Seattle vs. a .197 on-base percentage and .171 slugging percentage on the road. “I didn’t pitch well at home at all last year,” he said. Servais first jokingly blamed Diaz’s pulsing entrance music at Safeco — “Dema Ga Ge Gi Go Gu” by El Alfa featuring Bad Bunny and El Jefe. “It has to be the music,” he said with a chuckle. Diaz laughed at the music suggestion and then tried to pinpoint the problems. But the words “have to” in his sentence is the thinking Servais want to avoid. 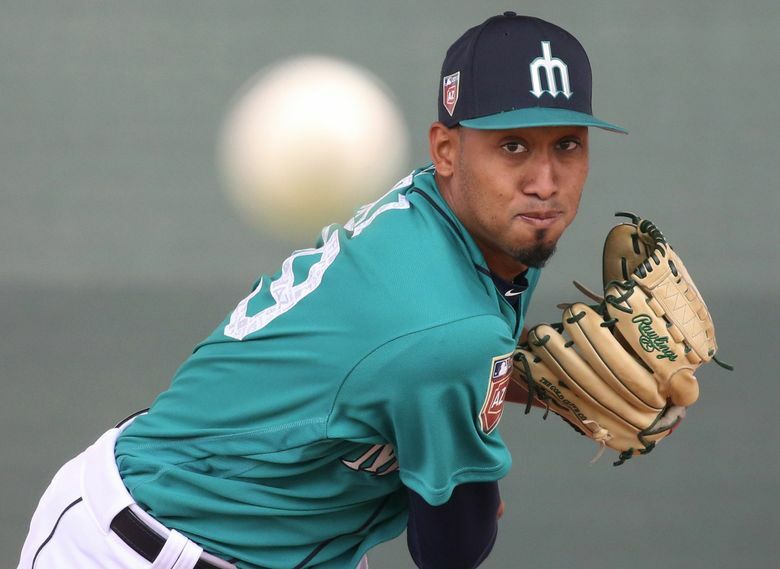 Diaz “gets to” be the Mariners’ closer in 2018. And he believes he’s ready for an even better season.